“Get outside coaching earlier.” – Slide from SalesForce presentation on their agile adoption. If you need expert help taking your company through an Agile transformation, contracting an onsite coach is a smart move. Whether you need a coach for a few weeks, a quarter, or longer, we can pair you with a practiced Agile coach committed to helping your company become Agile. The coaches in our network have behind-the-wheel experience with Agile program management and project development and will empower your teams to build on their strengths as well as be gut-level-honest about how they may be blocking their own progress. Whether you want to experiment with a “special ops” Agile dev team, or you are looking for companywide transformation, we can help. Agile coaching is a means of help helping teams learn the basics, but also how to work through the challenges that Scrum surfaces, as well as the shift toward team-based self-organization. This involves working with individuals on the product development team, management and leadership. 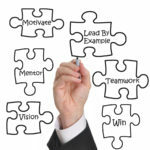 Moving from mentoring on the foundation of agile and what makes Scrum (or kanban, XP, etc) work, agile coaches move into true coach – helping others think through and make their own decisions, which is key to ownership, empowerment and motivation. Often teams, team members and managers are learning, trying new ideas, taking risks and stretching themselves in the transition to agile. Coaches help hold a mirror to them in order to help them see causes, options, trade-offs, and results that they may have otherwise missed in the busyness of just trying to get things done. Our coaches have worked with Forrester-leading agile coaching companies, hold advanced credentials and worked within many different companies and company cultures. Being local, we have flexibility to move when timing is best, and to wait when needed. Rocket Nine provides you with expertise, flexibility, local involvement and training support that is unmatched.